It's a new month and a new day - September 6, 2018! Life back in full swing after the lazy, languid days of summer and in the spirit of new beginnings, I have an announcement to make. Happy reBirthday to ME! Twelve years ago, Legs Malone was born upon the stage of the Bethnal Green Working Men's Club in London. My mind is boggled as I look back over these last 12 years and think about where I've been, who I've met and what I've done. I wouldn't trade my burlesque career for anything and I am deeply grateful to everyone that has supported, cheered me on and loved me over these years. For the last 12 years (as of today! ), I have been a burlesque performer, producer, teacher and advocate. Behind the scenes, I've been working diligently not only to heal but to help others do the same. If you have come to any of my classes, you will know how hugely passionate I am about helping people retrieve their own sense of beauty, worthiness and immense love-ability. I was always so fearful about "crossing the streams" but something happened and that fear fell away and became an impatience, a drive to share what was going on inside of me that I no longer wanted to limit to a single definition. If you want to learn burlesque, please be in touch. It would be an honor to share this inspiring and beautiful art form with you. If you'd like to visit my burlesque website, you can click on the word "burlesque" in the drop down menu above under "work with me" or just go straight to www.legsmalone.com. You'll see on my calendar more of those classes popping up, and if they are of interest to you, please be in touch. June is ending with a roar so loud that some folks are needing some extra TLC. The events occurring on local, national and international levels along with the recent, powerful full moon, the emotional terrain of this moment can feel rocky. I have been asking myself how can I help, and this came to me. To support your healing and the creation of positive intentions to pave a peaceful path into July, I am offering a special that lasts for July 1 & 2 - two days only. This special is only good for appointments on July 1st and 2nd, 2018. All sessions can be booked by clicking on the offering. For the breathwork sessions, an internet connection is required. All appointments take place remotely via my private Zoom room. For the reiki sessions, we will communicate via text or email (your choice). Breathwork Session Special - 5/21/18 - 5/31/18!! In honor of May's continuation and the warm transition from spring to summer, I am offering deeply discounted private online sessions! There is so much change happening in our world and our lives and I feel the best way to connect and show up for yourself in times of transition is to come back to your breath with support, nurturing and guidance. Book any two hour session with me between 5/21/18 and 5/31/18 and pay only $100 - !! This is $80 off an introductory session and $25 off a regular tune-up or series session. This special will only be offered for these 10 days in May and I encourage you to hop on it ASAP if you feel called as these sessions will fill up fast! I've been a practicing rebirthing breathworker for the last 8 years and have been honored to assist in many life changes and rebirths for hundreds of clients over the years. To book your sessions, head on over to https://annabrooke.as.me/ , pick the breathwork special and choose your time! Here's to jumpstarting and/or continuing your healing with grace, ease and a big inhale. It's been a minute since I posted here and I want to share with you the newest videos I have posted in the last few months on youtube! If you want to be notified of my upcoming posts, please click on subscribe when you visit www.youtube.com/wutaonyc - that's my channel! These two videos offer both a tool and a challenge! First up is my video on a nurturing eye rest exercise that you can do anywhere you wish. Find a few quiet minutes and try this out - your eyes will thank you! Second is a spontaneous video I filmed while stuck on a train with incredibly bouncy and loud fellow passengers (who were very quiet during the filming - !). In it, you'll find my 30 second breath challenge that is perfect for anyone who knows they need to take a good, deep breath every once in a while. Here's to feeling wonderful in our bodies as frequently as possible, and stay tuned for more videos! New video posted - Bladder 2 - great for relieving head tension and more! Hi everyone! I'm so happy to share this newest video I just whipped up. This point is wonderful to help ease tension in the head as well as clearing excess heat and wind from the body. Give it a try and let me know what you think! On the occasion of moving out of my beautiful home, I took a moment to make a quick video on wonderful points that you can use to help yourself ease through the processing of grief in the body. Please feel free to watch, use the points and share away. Here's to change feeling safe, and the loving release of grief so we may step into a deeper sense of peace in our bodies and lives. Essential Oils To Support Radiant Health! Hi everyone! Happy mid-September to you all. It's been quite the powerful end to summer with so many changes swirling about in our personal, communal, national and international communities. I have personally noticed a huge uptick in anxiousness and stress-related conditions in people across the board. I personally rely on lots of physical movement and my doTERRA essential oils to help keep me grounded and fully present in my body. Not only do the oils help with adjusting and maintaining my personal chemistry, but I have found them an invaluable tool for easing my own feelings of anxiousness and lack in these complicated times. I love sharing these amazing oils so everyone can have multiple wellness tools in their personal self care tool kit to make sure they feel supported no matter what. Earlier this year, the article below was published on Wu Tao Dance's main website and I love the confluence of two of my favorite things - Wu Tao and essential oils! I have copied the text of the article below but if you'd like to read it on the main Wu Tao website, you can click here. Hi everyone! Happy September to you all. It's been quite the powerful end to summer with so many changes swirling about in our personal, communal, national and international worlds. I have personally noticed a huge uptick in anxiousness and stress-related conditions in people across the board and I felt moved to share one of my many tools and strategies to counterbalance any anxious or stressful feelings. I personally rely on lots of physical movement and my doTERRA essential oils to help keep me grounded and fully present in my body. Not only do the oils help with adjusting and maintaining my personal chemistry, but I have found them an invaluable tool for easing my own anxious feelings and lack in these complicated times. I love sharing these amazing oils so everyone can have multiple wellness tools in their personal self care tool kit to make sure they feel supported no matter what. Want to visit my essential oils website? Click here! Earlier this year, the article copied below was published on Wu Tao Dance's main website and I love the confluence of two of my favorite things - Wu Tao and essential oils! I have copied the text of the article below and changed some of the wording to remain compliant with regards to the claims, but if you'd like to read it on the main Wu Tao website, you can click here. I am here to help connect you to your own highest good and the force of love that runs through all of us body, mind and soul. If you are looking for support or simply some new tools, please be in touch! Essential oils are amazing in their ability to replenish the body and mind. They can help you feel wonderful through their aroma, especially in times of stress. We all know essential oils help melt away feelings of anxiousness and keep our stressful feelings in check. But, did you know that each oil has it’s own properties and unique health benefits beyond bringing calm? We’re sharing the top 6 essential oils to bring balance to your health and how you can use them to balance the Five Elements. To get some of these beautiful essential oils for use at home or at work, please click here! Lavender is a must have in the home. The aroma relaxes while it soothes feelings of sensitivity or overuse in the body and can helrelieves mild headaches. Perfect for those nights when your mind is too busy and awake. Try adding a few drops on your pillow. It can help send you off into a dreamy sleep. Lavender can be used to balance all 5 elements and restore your Qi. Jasmine is a wonderful way to uplift your spirits and improve the condition of your skin. Jasmine also has a rejuvenating effect on the skin. Try some on scars and marks a few times a day. Try rubbing some Jasmine on your pulse points when you find yourself experiencing the blues or being overcome by negative thoughts. Jasmine can be used to balance all 5 elements and restore your Qi. If you’re looking for an immune boost before the cold season starts, add a few drops of orange in your bath and soak in the wonderful aroma. Add Orange essence to your bath and soak in its restorative powers. Orange is the perfect oil to balance the wood element. Did you know Rosemary is a natural support for helping to maintain blood pressure levels that are already in a normal range? If you’re looking to support healthy blood pressure levels that are already within the normal range, try using rosemary for that extra help. Adding a few drops of rosemary oil to your diffuser can also improve memory and concentration. Peppermint is a necessity for your essential oil collection because of its versatile uses. Peppermint is excellent for supporting healthy digestion, easing feelings of bloating and cramps after a big meal. Try diffusing some in the morning, the aroma will help wake you up to get a great start through the day. Peppermint can be used to balance all 5 elements and restore your Qi. The relaxing properties of Sandalwood will support the relief of any physical discomfort. It’s especially potent in creating deep calm in the mind. Try diffusing some Sandalwood in meditation and feel it’s calming scent take you to a deeper level. Sandalwood can be used to balance all elements except Earth in late summer. As I write this, Hurricane Irma is making her destructive way up into Georgia and Tennessee. I pray for everyone to stay safe and well out of harm's way in this monumental storm. My incredible teacher Ron Baker wrote a moving email followed by a longer blog post last week and I felt moved to share it here. This storm is not the last we'll see, and I deeply appreciate Ron's wisdom and insight into the teaching this storm holds. To learn more about Ron, please visit his website here. As this second (of four potential) hurricanes crosses into the United States, let's send out energy and prayers that each one is protected and that it all unfolds according to the highest good. We all have personal challenges and sometimes we share collective challenges. We all need support... and need to become proactive in the support of others to lead truly evolved lives of value, meaning and purpose. The eclipse that went across the US in August brought up lots of energy... to a country that is already shaken up emotionally from the choices we have set up for ourselves, just in the government alone. It is a time of heightened feelings and the emotional body is stirred up. On a soul level, it is not random that we are now seeing these emotional energies reflected in these storms. And this is what is transpiring for now. Not good. Not bad. Simply the energetic response to the whole. Let's act in ways in our lives that support healing and peace, in how we treat one another. These are some of the opportunities of this time. To read Ron's longer blog post on this same topic, please click here. I write this from beautiful Greenville, SC as May is just barely an hour old. It's incredible to me that April flashed by and here we are, five months into the year already. Incredible how that little thing called time keeps on flying - ! I'm thrilled to be offering lots of great classes and gatherings this month, including LOTS of essential oils classes, Brooklyn Breathwork's New Moon Breathe on May 24th and some soon-to-be-announced Wu Tao classes. Click over to my calendar and check out what's next! Warmest, beautiful May wishes to you all! Anna Brooke Healing comes to MINKA Brooklyn! I am thrilled to announce that beginning in December, I will be seeing private clients and hosting group breathes at gorgeous MINKA in Brooklyn! I am so excited to be a part of this gorgeous new space and community and cannot wait to begin hosting my Brooklyn Breathwork group breathes every new moon beginning in 2017 as well as seeing private clients again! If you or anyone you know is interested in receiving reiki, rebirthing breathwork or Wu Tao Dance instruction, please be in touch! To book a reiki session with me, please click here! To book a rebirthing session with me, please click here! If you want to schedule an appointment with me at a time that is not listed on MINKA's website, please email me by clicking here! This is MINKA's beautiful website! For those who receive my newsletter or follow me on twitter or facebook, you'll know that I had plans to go to Bali in order to become a Wu Tao Dance teacher trainer. Needless to say, the desire is very much there but reality didn't exactly sync up with my plans. I got to the airport, rip roaring and ready to go. Upon handing over my passport to the gate agent to check in to my flight, she spent some time flipping through my passport and looking at all the pages. I have been extremely fortunate to be able to travel to many far flung places and my passport bears the trace of many incredible journeys. The thing I didn't know, however, was that my passport was incredibly full of these stamps. In fact, too full. Indonesia requires at least one full, empty page of your passport in order to get the visa upon arrival. My passport had no empty pages, only one half of one page. The amendments pages were wide open, but lo and behold, they cannot bear any stamps of entry or exit. So here I am, in Brooklyn, and not in Bali. One of the most valuable lessons I have ever learned (and am still learning) is the lesson of surrender. Water does not freak out if a stone is in its river path - it just flows past it. The water does not get all frothy and begins to plan how to threaten litigation. Nor does it scream for acknowledgment in what a hard and unfair time it is having because of the stone in its way. It just flows, and there is a mighty lesson in there for me. When it became clear that there was no way I could get on the plane, I dragged my deflated, soggy self off to the side to regroup. I had a choice to make and I knew that I had to accept that this trip wasn't happening. The question was, how do I salvage the plans, tickets and financial commitments I made with as much grace and ease as I could muster. Fast forward to 24 hours later. The airlines overrode my non-refundable, non-transferable ticket and let me change the ticket within a certain time frame with some annoying yet affordable fees. Michelle, the incredible woman who created Wu Tao, said that she would return to Bali within my dates so my training could happen. As unplanned as this was, I must say it has worked out incredibly well. I went to the park yesterday to literally dance it out. The photos below are of me dancing the Air Dance, the first of the five Wu Tao dances. It is correlated to the season of autumn, the action of letting go, and the emotion of grief. I stretched, breathed, moved and surrendered to the dance, knowing that at the end of the day, I have my health, my wealth and am surrounded by so much love and support that it is impossible to quantify it. In this unbearable moment of the election, of the fate of our nation and of our world and the billions of people who live upon it, I want to plant the seed of surrender. What can you let go of in this moment and surrender to the reality of the relationship, situation or state of being? Surrender has some unpleasant connotations in our society, likely because we have lived in states of war for millennia, and in a state of war, surrender is death, dishonor and eradication. If you feel this way, I invite you to let that thought go. What can you let go of in order to lighten your load? What are you willing to surrender to, to give up the fight and give permission to whatever it is to simply be? Sending bright November blessings to you all. Here's to accepting, flowing and surrendering to the tides of our lives so we can move forward in grace, peace and ease. 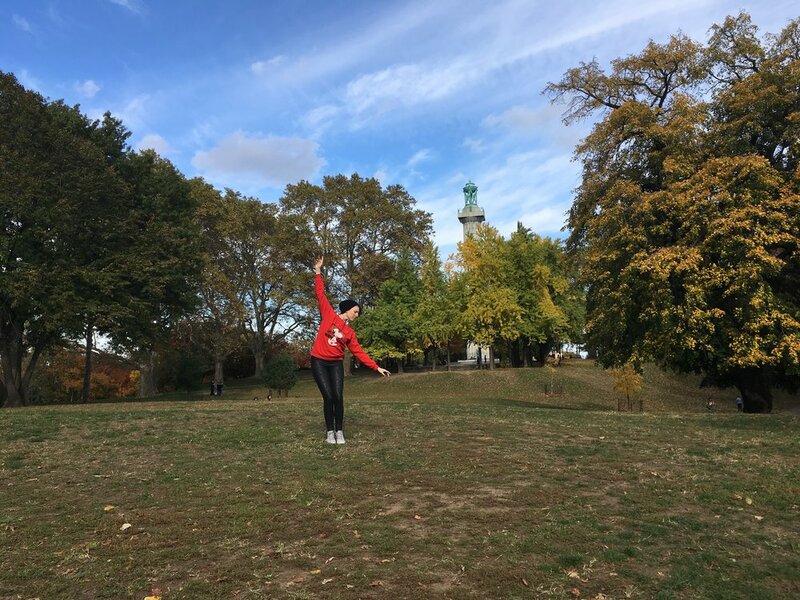 Photos below taken in Fort Greene Park on November 5, 2016. Hi, friends! November is upon us and although autumn holds the energies of constriction, death and preparation for hibernation, I am personally feeling an enormous boost of creativity and birth energy. I am typing this as I prepare to head to Bali for almost two weeks to become a Wu Tao Dance teacher trainer. I am incredibly excited to be the first person to regularly teach Wu Tao in America and now, I'll be able to train future Wu Tao teachers! This is an amazing opportunity and I am so grateful to Michelle Locke, the founder of Wu Tao Dance, for her confidence in me and unwavering support. Here's to dance, health and bliss!! If you'd like to have a gander at my most recent newsletter, you can find it by clicking here. Stay tuned for more class and event announcements for the rest of the year. In the meantime, please visit my calendar of events to see the upcoming dates for Brooklyn Breathwork and essential oils classes. I look forward to seeing you there! My warmest wishes of health, wealth and wellbeing for this wonderful month of November. October is upon us in style! Hey all! I just finished my October newsletter and you can check it out here! I am teaching some fantastic classes this month, including Brooklyn Breathwork's first ever collaboration with art therapist Emery Mikel this coming Sunday 10/9! You can read all about it and register by clicking here! I also can't believe that I am only one month away from going to Bali with Wu Tao's founder Michelle Locke to become a teacher trainer!! If you are interested in learning Wu Tao from the comfort of your home or even becoming a Wu Tao teacher yourself, please click here! Wishing everyone a joyful and peaceful October and I look forward to seeing you in class very soon!